What is an EPDM Gasket? Gaskets play an important role in a mechanical assembly. They act primarily as the seal between two attached parts so that no leak occurs between them. 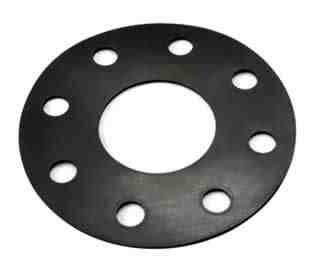 To function as they are designed to, gaskets must produce an initial seal and maintain this seal over a period of time. Once the time comes, they must also be easily removed and replaced. Gaskets are usually made from flexible and soft materials such as rubber and often utilized as seals to prevent leaks in pipes. They have other purposes, however, such as dampening vibrations and as mounting. Rubber gaskets are preferred because they are soft and have inherent properties based on the kind of materials used. One of the most popular types of rubber gasket is EPDM gasket because of its desirable qualities. EPDM (Ethylene Propylene Diene Monomer) is a synthetic elastomer rubber with a wide range of industrial and commercial uses. This substance is used for seals (in those times when silicon is unwanted), electrical insulation, solar panels, belts, tubing, radiators, garden hose, washers and electrical insulation. Its main properties include its exceptional resistance to heat, ozone and weather. The product is also well-known for its electrical insulating properties and resistance to ordinary diluted acids, alkaline and ketones. EPDM gasket is, in fact, one of the most widely-used sealants for its superior performance even in extreme weather conditions. It maintains stability at temperatures range of -50°C to 150°C. The product does not leave stains on PVC window frames. It is compatible with hot and cold water and fireproof hydraulic fluids. Compared to gaskets manufactured from different materials, EPDM gasket is resistant to extreme weather, ageing, wear, oxygen, ozone and UV light. That is why it is ideal for exposed applications. EPDM gasket’s most common use is in the automotive industry where they are widely applied in automobiles as window seals, trunk seals, door seals and hood seals. It is also a popular choice among contractors and roofers as roofing membrane. A desirable quality of the product is that it does not contaminate rainwater, an ideal situation for rainwater harvesting. EPDM granules are combined with polyurethane binders and sprayed on asphalt, concrete, wood, bricks to produce soft and non-slip safety surface for wet areas such as pool decks. Another useful application of the product is its use as safety surface for playground equipment to lessen injuries from falls.